I have several recipes coming up that contain chipotle peppers in adobo sauce. Because of this I thought it would be a good time to give you a few tips about them. You can find these in the Mexican aisle at your grocery store. They add great flavor to many Mexican type dishes and a little goes a long ways. 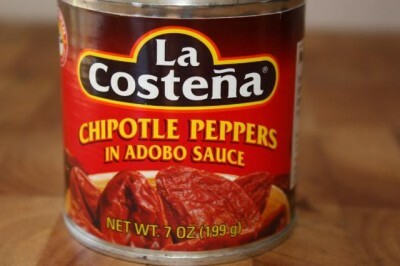 I really like to use chipotle peppers in adobo sauce in my cooking. My husband likes food spicy, so he likes the spicy flavor that these add to food. I like the smoky flavor that they add. You can take a simple dish and give it a lot of flavor and spice, just by adding a little chipotle pepper to it. These add a lot of flavor and spice, but you really only need a little. Seriously, unless you like foods really spicy, one or two peppers is enough for a whole meal or dish. The problem is that you have to buy them in a can and you usually get at least 6 peppers per can. I have never used 6 peppers at one time. So, what do you do with the rest? You freeze them. It works great. I use the one or two that I need at the time and freeze the rest. I usually just put one or two into each ziplock type bags and freeze them until I need to use them. I do not freeze these in plastic containers because I have found that the flavor stays in the plastic. So, unless you want your plastic containers smelling spicy, you might want to use something else, like freezer bags. Adding things like this to food can add a lot of flavor for just a little price. This is how you take a simple and frugal rice and bean type dish and make it more interesting. One can costs under $2, by freezing the extra peppers, I can easily use them in 4 or 5 meals. This keeps frugal meals frugal, but adds a little more flavor to them, for very little cost. I have two simple and frugal dishes coming up that use these peppers. Do you like and use these? If so what do you use them in? I have a can of these and was wondering what to do with them. Thanks for the freezing tip, that will come in handy. Looking forward to your recipes coming up that use these. Thanks. We love these! I use them in everything–try just a smidge in your hot cocoa. BTW, Tabasco makes a chipotle sauce that is excellent. For freezing, put two cans of chipotle peppers and one 8 oz can tomato sauce in your food processor. Process until smooth. Freeze in a cottage cheese carton (just break off a piece) or in individual portions ice cube tray portions. The tomato sauce adds a bit of bulk and prevents you from dumping in too much and accidentally having five alarm casserole. i have used them in one recipe so far and it’s a weight watchers chicken picadillo recipe. i live in el paso, tx so i enjoy experimenting with true mexican ingredients. where can i find the recipe for the chicken picadillo? I Love El Paso – it’s my home!! I totally agree with freezing the chipotles….but splitting them up individually is genius. I once froze the reminder of a can, and had a big hunk of peppers. What a mess! I just broke off a chunk here and there as needed, but next time I’ll split them up. Thanks for the tip! Wow, haven’t had these in years. They are definitely going on my shopping list! I use chipotle peppers to make chipotle mayo. We love this stuff but it only calls for one chipotle pepper. I never knew what to do with the rest of the peppers so I usually just put them in the fridge til the mayo ran out and it was time to make more. By then I always questioned whether or not they were still good and ended up buying a new can. Thanks for sharing this tip! My recipe call for a 7 oz can of chipolte pepper in adobo sauce. It says to discard the peppers and remove seeds. It does not make sense to me.There is nothing left to put in the dish. Am I reading the recipe wrong. Do they mean to remove the seed and put all the peppers in with the rest of the ingredients. I am making a chipolte chicken marinade. @Sarah Masters, I am not sure what they mean. A whole 7 ounce can of chipotle peppers would make a dish very spicy. I usually only use part of the can. Maybe though they mean the sauce part, not the actually pepper. I really don’t know. I am sorry that I can’t be more help. a stick blender is well suited for this. Thanks so much for adding things like this. I get frustrated because I am not a very experienced cook, and sometimes there are things in a recipie that I have never heard of or don’t know how to buy or use. I found a fish taco recipie with “1/2 cup adobo sauce from chpotle peppers” as an ingredient for the dressing. Never heard of adobo sauce :). So, you helped. Now my question is, is there 1/2 cup of “sauce” in the can? Guess I’ll have to buy it and find out. Blend all ingredients in food processor until smooth. Adjust flavor to taste. Serve on hamburgers or as dip on chips. Glad to know about FREEZING these!! Many a can has can bad while waiting for a purpose in my frig. Thanks! I have a recipe that says “1 med/large Chipotle Pepper (from Adobo)”. Never quite knew what that meant or what to look for in the store. So this article has helped me out so much. Thank you!!! !